Can this app cure loneliness? Entrepreneur Sam Feuer's app Smacktive is a social networking app focused on activities. One may be the loneliest number, but with Sam Feuer's latest app, there should be no excuses for finding new friends. Smacktive, which launched out of beta on Monday, could help remedy loneliness -- and counter another epidemic while it's at it: obesity. The app helps people find others nearby to do completely platonic activities with. Think Tinder meets Meetup. Loneliness is one of the biggest healthcare issues today, and research shows that it can contribute to things like dementia and heart disease. 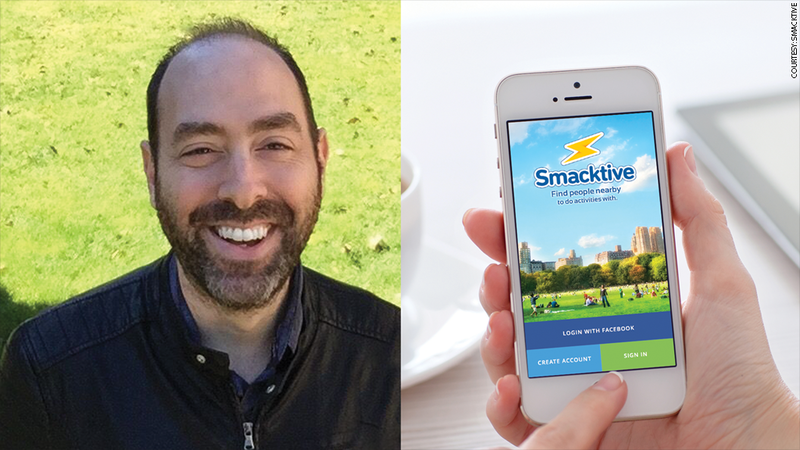 That's why Pete Moore, the founder and managing partner of Integrity Square, was particularly interested in Smacktive. When Moore attended the Clinton Foundation's Health Matter Conference in January, one speaker asked the question: "What's the biggest issue in the healthcare industry?" Bruce Broussard, president and CEO at Humana (HUM), shouted out in response, "loneliness." Call it serendipitous, Moore was introduced to Feuer in later that month through a mutual acquaintance and they discussed the concept behind Smacktive, which Feuer was building. "I'm a big Uber user so we talked about, 'What if we're able to GPS locate people and not just have them go to clubs -- but have it be fitness-related?'" said Moore. Related: Is Ello the anti-Facebook? Feuer's idea also strongly resonated with Moore on a personal level. Moore moved from New York to Manhattan Beach, Calif., about a year ago and has struggled to find people to do activities with. "I ended up getting a tennis instructor because I didn't have an avenue to find someone who was available to play," said Moore, whose firm now holds a 30% stake in Smacktive (although he declined to say the amount of the investment). This sentiment is universal -- and one that hits close to home for Feuer. In his younger years, he struggled finding others who shared his interests. Growing up as a Jewish kid on welfare in a primarily Italian Brooklyn neighborhood, Feuer recalls always feeling different than his peers, wishing he could meet like-minded people. "At 12 or 13, I thought, 'There are probably millions of people that felt the same way I do,'" said Feuer, who has launched over 20 apps to date and also heads up MindSmack, an interactive agency he founded in 1999. "People need drive, motivation, and purpose. This helps do that -- and reduce depression and obesity by getting up and out. They just need a 'healthy smack' to get up and do it."